Shop :: MIFLEX Hoses / Accessories :: Miflex Xtreme LP Regulator Hoses :: Miflex Regulator Hose | Blue :: Miflex Xtreme LP Regulator Hose 150 cm - 60" (Blue) - 3/8"
These 150 cm (60 inch) Blue Miflex Xtreme Low Pressure (LP) regulator hoses with standard size 3/8-inch UNF male threads are just great for using to attach your 2nd stage regulator to your 1st stage regulator. The flexibility of the Miflex Xtreme LP regulator hose makes the second stage more comfortable in the mouth and results in smoother hose routing, particularly with long hoses. These low pressure hoses are great for stage/deco/pony cylinders, and we offer the 100 cm (40 inch) length commonly used for stage/deco and octopuss hoses in your choice of colours. These Miflex Xtreme low pressure regulator hoses have a 3/8-inch Male UNF thread at the end that screws into a first stage LP port, and a 9/16-inch Female UNF connector at the end that screws on to the second stage regulator. Premium packaging which doubles as a water resistant document wallet - $8 value. Miflex Xtreme hose production is carried out to the highest quality and standards at their Italian automated assembly and testing line. Each and every hose is subject to more than 30 individual safety and specification checks, automatically during production, to deliver a product of the highest quality. Miflex offer a full warranty on their hoses and continually review their products to assess and improve any areas as required to suit today’s changing diving market and it's requirements. Miflex provide their hoses in Miflex branded dry-bags and each bag contains an insert with details of our quality and also information on installation and safety as well as where you can register your purchase of diving hoses and become a member of the Official Miflex Xtremist club. 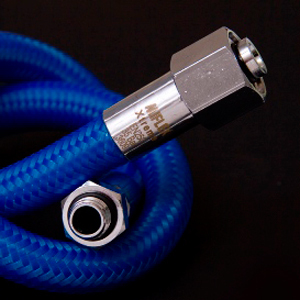 Miflex hoses are now used as standard on equipment by many leading diving brands. If you want the best low pressure regulator hose, ensure you are diving with a Miflex Xtreme LP Regulator Hose. This is used by the majority of diving manufacturers. The majority of our range of Miflex regulator hoses utilise this fitting combination. This is a style of regulator hose, used by a number of diving manufacturers for their primary supply. If you are in anyway unsure as to your requirements, please check with The Scuba Doctor. All other requirement to connect to other styles of equipment/connections are made with the use of adaptors. Occasionally there is a requirement to connect your regulator hose to equipment with differing connections. We offer a range of solutions via adaptors that maybe able to assist and below are just a small number of these to assist you. Miflex Xtreme LP regulator hoses are available in a wide range of lengths and colours. Miflex Xtreme LP Regulator Hose 56 cm - 22" (Blue) - 3/8"
Notify me of updates to Miflex Xtreme LP Regulator Hose 150 cm - 60" (Blue) - 3/8"